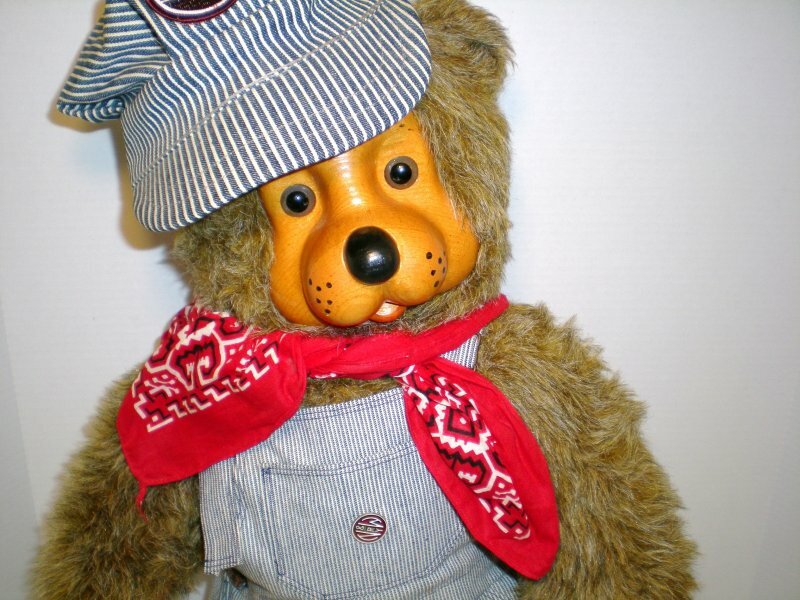 Robert Raikes original 22 inch tall Train Engineer Bear is a Woody bear hand carved by Raikes himself in 1987. Raikes carved only 25 of the original engineer bears. He is a black and gray variegated acrylic fur bear (though under certain light there is also appears to be brown in his fur). He has hand painted freckles on his long snout and inset plastic eyes, jointed arms and legs and swivel head. Train Engineer is dressed in a blue and white striped engineer overalls and cap with the red and white bandanna (scarf) tied around his neck. The number 5 Train Engineer (this one is Number 14) is pictured in Robert Raikes Bear and Doll Story, Revised Edition, p. 65. The bear was purchased through a private sale from the original owner who added the Union Pacific patch to the cap and pin to the chest. 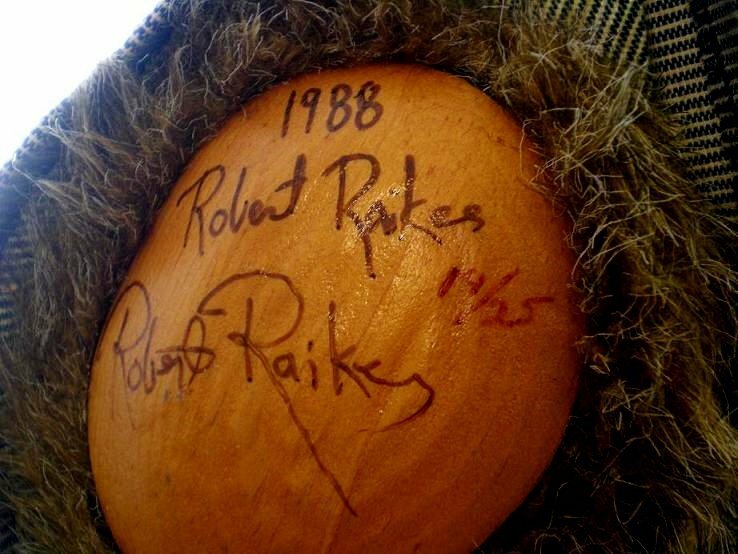 The bear was hand signed and numbered by Robert Raikes. 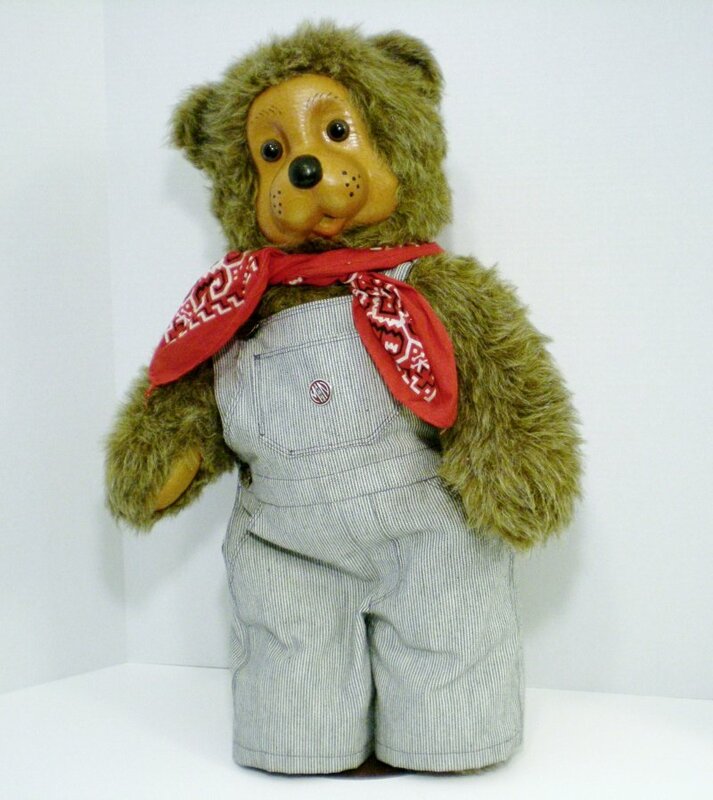 The bear was later signed again by Robert Raikes at the Linda Mullins Bear Show in San Diego, CA in 1989. So this Train Engineer is signed twice!! When purchased in 2003 the Union Pacific pin and patch were replaced with the Norfolk and Western Railroad patch and pin purchased from Roanoke, VA Transportation Museum. 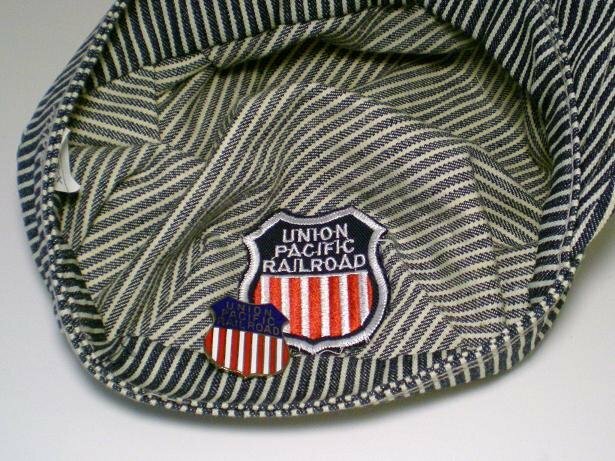 The Union Pacific pin is now in the front pocket of the overalls and the patch is gently tacked inside the cap. Both sets will be included in purchase as will the doll stand. Train Engineer was later used as model for smaller version Applause bear Lionel. The face design was also reproduced by Applause as Sebastian in the First Edition 1985. 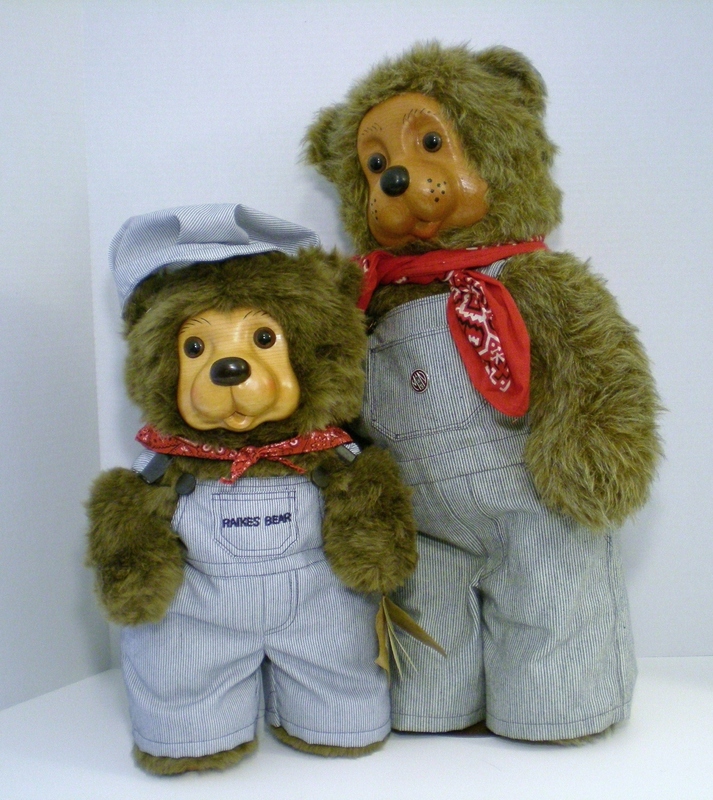 Woody Bears, all hand carved by Robert Raikes himself are rare and usually of limited editions of 1, 10, 25, or 50. Raikes carved 25 Train Engineers and this one is hand numbered 14. 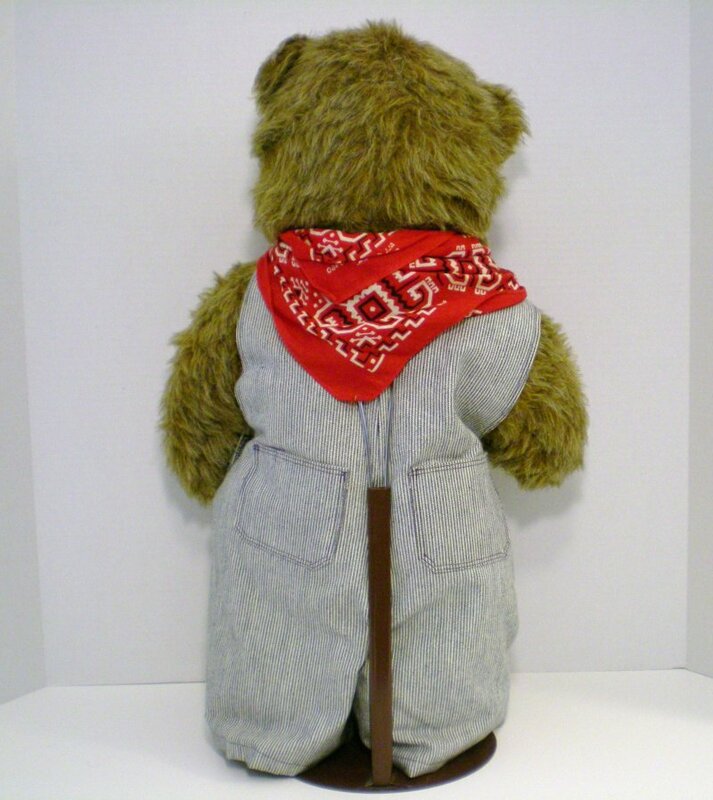 He comes with the Woody Bear Certificate of Authenticity. These bears do not have the collector's box. 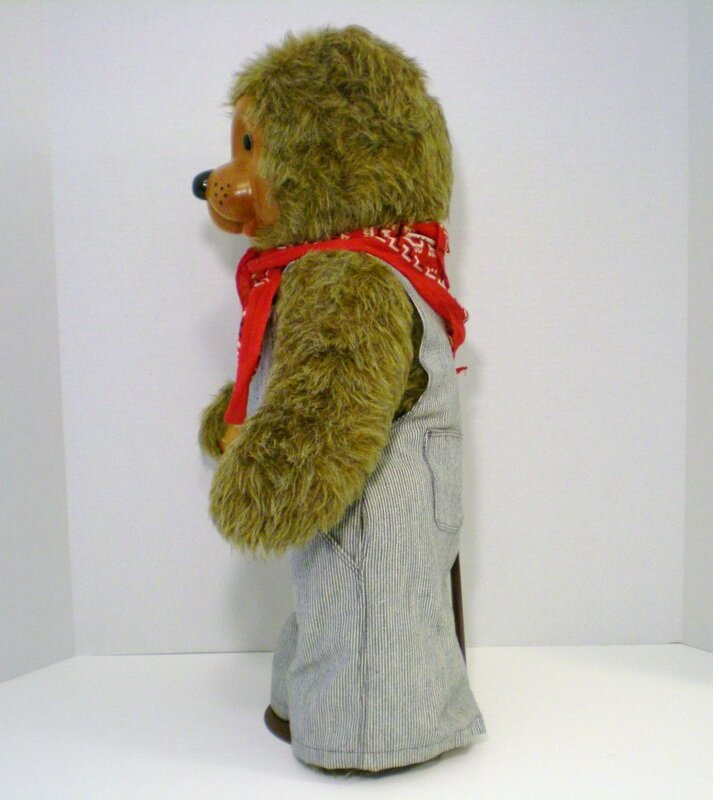 He is in excellent condition, but has spent some time as a display bear. He comes from a smoke free home. Shipping will be by first class in poly bag.